Students are accompanied by an adult while participating in this 45-minute class. 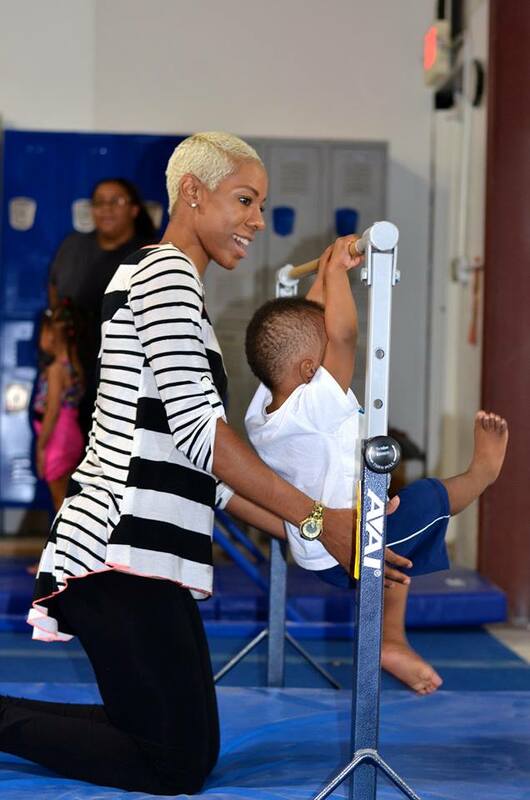 Children focus on gross-motor skills as they rotate between activities on the bars, balance beam, floor, and trampoline with their parent and coach. They learn to hang, swing, and flip over the bar, as well as support themselves in a front-support on the bar. They practice walking across a balance beam, rolling forward and back down cheese-shaped mats, crawling through tunnels, jumping in and out of hoops, and supporting themselves on their hands. Balls, hoops, parachutes are utilized during this exciting toddler class. In this 45-minute coed class, students learn the concept of progressing through “activity stations.” The children warm-up together for 15-minutes while focusing on proper stretching techniques through games, role play, songs, and rhymes. The remainder of the class consists of 10-minutes on trampoline, and 10-minutes on two events: floor, bars, or balance beam. The students learn to hop, jump, kick, roll, go upside down, support their body weight on their hands on the floor, and kick their feet in the air; all skills which prepare them for higher level gymnastics such as cartwheels, handstands, and bridges. On the bars they learn to swing, hang in different positions, support themselves in a front-support, go around backward on the bar, and execute a pull-over on the bar. The beams are used to teach stationary balance skills, along with walking forward and backward, kicks, jumps, dip walks and classes. Accessories such as foam blocks, beam bags, and cones are used as teaching aids. This 55-minute class for boys and girls teaches basic gymnastics skills on vault, bars, balance beam, floor, and trampoline, while using stations and accessories such as incline-mats, folding-mats, donut-mats and barrels. These teaching aids assist students as they learn more difficult gymnastics skills. After a 15-minute warm-up, students spend 15-minutes each on two additional events, and 15-minutes on trampoline. Many students will learn how to roll forward and backward, do a cartwheel, do a handstand up against a wall or mat, walk forward and backwards on the beam, in addition to kick walks, dip walks, cLasses, and balance moves. On bars they will learn how to do a glide swing, begin a pull over by themselves, and feel comfortable in the front support position. Vault drills are designed to teach students proper technique in running and jumping on the board, and how to do a variety of jumps off the board.